Lochaber, part of the North Coast 500 route. Almost 200 motorcyclists were checked in the Highlands over the course of the bank holiday weekend as part of an operation aimed at promoting road safety. Road policing officers carried out high visibility patrols between Friday and Monday with the aim of encouraging safe motorcycling. 197 motorcycles were stopped in the Highlands, including 94 on the A82 in the Lochaber area, and the remainder on roads making up the North Coast 500. One motorcyclist was reported to the Procurator Fiscal after the vehicle was detected travelling at 90mph southbound on the A82 at Rannoch Moor on Monday. A small number of other offences were detected, including registration offences, licensing offences and construction and use issues. Road Policing Sergeant Ewan Calder said: “Motorcycling is an excellent way to enjoy the roads of the Highlands and our engagement with the vast majority of the riders we spoke to was very positive. 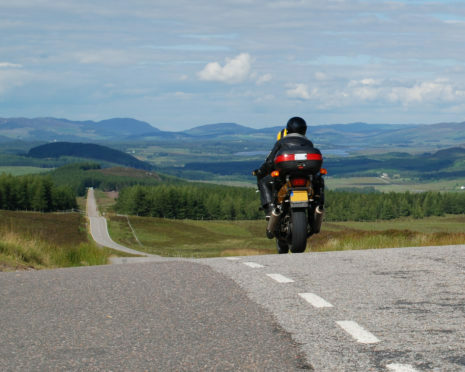 “We are keen to raise awareness of the increased number of motorcycles in the area during the summer in order to make sure all road users are able to experience the Highlands safely. “Motorcyclists will always be more vulnerable than car drivers. We certainly don’t want to discourage motorcyclist but all we ask is to ride safely according to the prevailing road and traffic conditions. “Similarly I would ask car drivers to be aware of the possibility of bikes on the road and to give them the space they require. Lochaber is once again hosting the annual Scottish Six Days Trial motorcycling event, with stages in various locations around Fort William for the rest of this week. Sergeant Calder added: “The Six Days Trial is a very well established event in Lochaber and we are pleased to be policing it again. “We will be carrying out high visibility patrols around the events to keep traffic flowing and to carry out any enforcement should it be required.